Sharing information in supply chains may prompt conflicts of interest among stakeholders, presenting a challenge for achieving the long-term goals associated with platforms such as I-Choose. In this chapter, we analyze such potential conflicts and possible ways to overcome them, on the basis of convention theory and as a result of case studies. Through semistructured interviews with stakeholders of the coffee supply chain in the NAFTA region, we found the presence of four worlds, or “orders of worth”: the domestic, civic, market, and industrial worlds, according to the terminology of convention theory. Our empirical work shows that in practice, supply chain participants can be characterized by a combination of at least two of such views. We also specify the conditions that make different supply chain configurations and set of values more or less amenable to the changes implied in the disclosure of private information that the I-Choose platform requires. 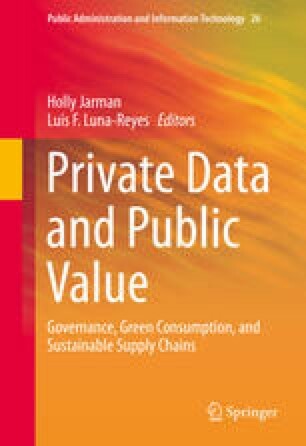 In the conclusion of this chapter, we draw policy implications to design the right incentives to the private sector to enhance public value.